Chances are, you know what Fortnite is. (On the off-chance you don’t, it’s a video game that drops you and 99 other online players onto an island replete with guns and ammo, and you battle it out to be the last player (or team) standing). It’s fun. It’s a lot of fun. Your player can ’emote’ – meaning, you can make them dance, blow kisses, ask for supplies and more. Well, flossing is one of those emotes. You know what flossing is, and you’ve almost definitely tried it. My Fortnite-loving, street dance-mad daughter enjoys my attempts, anyway. Fortnite Fever has swept the nation the past few months, so it’s no wonder 56% of parents are worried about how much time their children spend playing computer games.. That’s why we’ve launched* a brand new ‘Emote Royale’ class, so kids can ‘floss’ and ‘flapper’ their way to fitness. 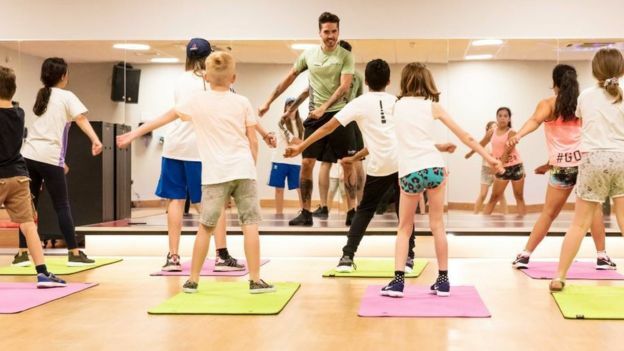 Developed alongside a team of 12-year-old consultants, we’re urging children to swap the controller for choreography in this fun and unique workout class. *Available at select DL Kids clubs across the country throughout the summer holidays. That’s right, they’ve created ‘Emote Royale’, a fitness-class inspired by Fortnite (brand blog on it here). It’s available at select kids clubs across the country throughout the summer holidays, but it’s not insensitive to suggest that it might well be as much for the social media love and coverage (a smattering, at the time of writing, including the BBC, so nice), as it is to get kiddies up and flossing. Don’t expect to see this at a David Lloyd in the back-end of nowhere, is all I’m saying.